No Weapon Formed Against UK Shall Prosper! “In righteousness you will be established; you will be far from oppression, for you will not fear; and from terror, for it will not come near you. “If anyone fiercely assails you it will not be from Me. Whoever assails you will fall because of you. “Behold, I Myself have created the smith who blows the fire of coals and brings out a weapon for its work; and I have created the destroyer to ruin. “No weapon that is formed against you will prosper; and every tongue that accuses you in judgment you will condemn. This is the heritage of the servants of the Lord, and their vindication is from Me,” declares the Lord,” Isaiah 54:14-17. We decree and declare to you who are PURSUING RIGHTEOUSNESS: you will be ESTABLISHED, far from oppression, with nothing to fear, far from ruin, for it will NOT COME NEAR you. 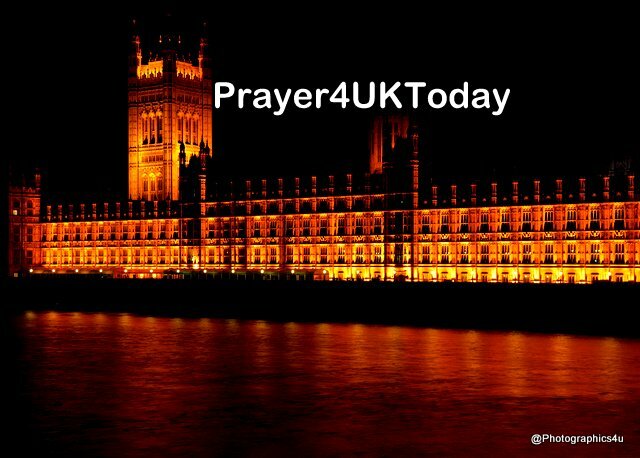 We pray that all those who are working to thwart God’s purposes with regard to Brexit will be stopped in their tracks. Any alliance that forms against Britain will not be of the Lord’s/ Adonai’s doing; whoever tries to form such an alliance WILL FALL because of you! We decree and declare NO WEAPON MADE WILL PREVAIL AGAINST THE UK. In court you will REFUTE EVERY ACCUSATION. No tongue raised against Britain will have any effect. The Servants of the Lord/ Adonai INHERIT ALL THIS; the REWARD for their RIGHTEOUSNESS is from Him! We decree and declare the Lord/ Adonai is MOVING ACROSS the LAND! Every Valley will be filled in, every Mountain and Hill lowered, the bumpy places will be made level and the crags become a plain. Your Kingdom Come Your Will be done with regard to Brexit. THEN the GLORY of the LORD/ ADONAI will be REVEALED; all Humankind together will SEE it, for the mouth of the Lord/Adonai has spoken! Those who BRING GOOD NEWS, will shout it out from the Mountain tops! Say to the cities, “HERE IS YOUR GOD! Here comes the Lord God/ Adonai Elohim with POWER, and His Arm will RULE for Him. We GO from STRENGTH to STRENGTH and appear before God/ Elohim. Lord/ Adonai, God of Armies, thank You for hearing and listening to our prayers! The Lord God/ Adonai Elohim is a SUN and a SHIELD, He BESTOWS FAVOR and HONOR; HE WILL NOT WITHHOLD ANY GOOD from those whose Lives are PURE. HAPPY are we because we TRUST in the Lord! We decree and declare the Lord God Almighty/ Adonai El Shaddai has RAISED UP His Servants in government and across the Land! He has given His HELP to these WARRIORS, He has raised them up and CHOSEN them from His People. We decree and declare the Lord’s/ Adonai’s Hand will always be with His Chosen Servants, and His Arm will GIVE THEM STRENGTH. No enemy will outwit them, no wicked man will overcome them. He will CRUSH their FOES before them and STRIKE DOWN those who hate them. We decree and declare the Lord/ Adonai says, “My FAITHFULNESS and GRACE will be with My Chosen Servants; through My Name their POWER WILL GROW. I will put their Hands on the Seas and their Right Hands on the Rivers. We decree and declare a CLEANSING and UNIFYING of the people of this land as these decrees go forth. See attached flyer with the programme details.